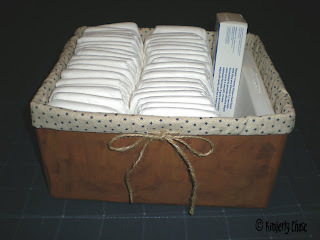 You can use this box for anything, I am using it for diapers. I used a box from the post office, cut off the lid flaps, taped the bottom of the box (so it would stay a box), then I glued paper onto all of the sides. Then I painted it. On mine I used three different color. Doing the base coat a medium color and then dry brushing on a darker and a lighter color in different directions. My husband thought it looked a little like a metal box, with how it turned out. I also made a fabric liner for it, fished some twine through it and there you go, an inexpensive container.